The final CAPTAINS 4th and final project meeting took place in Athens, Greece on the 18th of December 2012, prior to the project’s conclusion at the end of December. Partners were in attendance to present their organisation’s work towards their assigned deliverables, and collaborate on the compilation of all information for the final CAPTAINS project report. Prior to the final project meeting was the CAPTAINS conference, at which numerous key policy makers and stakeholders were in attendance. The product was well received by more than 100 participants of the conference, with all identifying it as innovative and fit for its purpose. The Captains project came to an end at the end of December 2012, with all project aims and outcomes being met fully through the collaboration of all partners. All documents pertaining to dissemination activities, partner meetings and development sessions, mandatory reporting, etc, were compiled and sent to the project contractor to be prepared for submission with the final report in the beginning months of 2013. All CAPTAINS dissemination materials have been produced and printed for distribution to organisations and institutions, including the product leaflet and aforementioned CD. The CAPTAINS product is ready and available on the product website located at www.captains.pro. This includes a link to access the KWEBO e-learning platform, which facilitates communicative and collaborative learning amongst the website’s community using a multitude of user-friendly tools. Learners can also download the standalone version of the course from the website for self-study on a computer or laptop, after which an internet connection is not mandatory to study. Additional, final piloting sessions were undertaken in order to identify any outstanding issues with the content on the KWEBO platform. The results of this piloting complemented the prior piloting sessions that have already been completed by all partners in the project. The CAPTAINS digital courses and e-courses for Communicative Maritime English learning have been released and pilots with internal consortium learner communities have been initiated. Digital courses, resulting from WP4, are functional in standalone mode promoting self-learning only, while e-courses, resulting from WP5, are enhanced further with online, collaborative and group-based learning activities as well as synchronous virtual class services, allowing online interaction with tutors and facilitators, accessible from and hosted on AIT's next generation e-learning 2.0 system, Kwebo, at http://kwebo.ait.gr:8081. Currently, access to both digital courses and e-courses is restricted to the participants registered. In order to access either the digital courses or e-courses, you are kindly requested to complete this digital courses request form or e-courses request form the purpose of which is simply to automatically collect data from interested parties for dissemination purposes as well as issue temporary accounts to access the e-courses on AIT's next generation e-learning 2.0 system, Kwebo. In this way, you will be given the chance to be a member of an evolving Maritime English learning community. The new project website, being developed by partner C4FF for the launch of the Captains product, is being finalised in terms of design and content. This will be hosted live to replace the older project website in order to mark the launch of the product into the post-funding period. The new Captains website is currently under development by graphic designers embedded within the C4FF project team. When finalised, this website will be used to mark the launch of the Captains product into the post-funding period. All partners on the project took part in a Skype meeting to discuss the work requirements in order to bring the project to an end. C4FF and EPAL partners took part in discussions with one another to plan the project’s dissemination plan and activities for the forthcoming months and the post-funding period. This plan was drafted and finalised as part of the final project deliverables. The papers for the IMEC 23 conference, to take place in October 2012, were finalised. Papers were developed in this month for the IMEC 23 conference that takes place in October 2012. These will be presented at the conference in order to garner attention and publicity for the Captains project and its proposed results. These papers will also be published in the IMEC 23 proceedings. Designers in the C4FF partner project team are discussed the options for the creation of a new Captains website, which will be used to mark the product’s launch into the post-funding period. Some designs were chosen amongst the team, and verified with the other project partners, in order to begin work on the website design and coding. All partners involved in the Captains project took part in a review of the first scenario, which was developed by the EPAL partner. Feedback and suggestions were provided by partners with a view to improving the scenario, which was subsequently finalised. All of the Captains website content was reviewed this month, with news sections being updated and the whole content of the website being proofed and revised by native English speakers within the C4FF organisation. The interim report was successfully submitted by the project contractor along with all supporting partner documentation. Partners met on Skype to discuss the forthcoming months and the necessary work to be completed in order to ensure all remaining outcomes and deliverables were met for the Captains project to be successful. A work plan was devised and agreed upon to meet these aims. 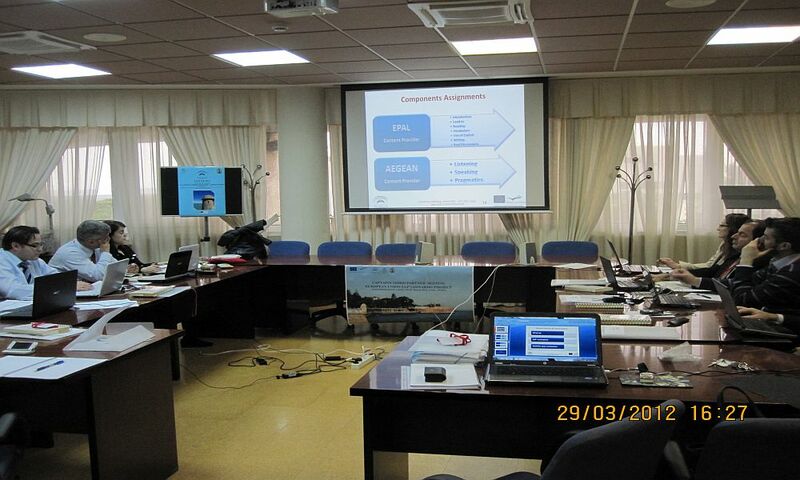 All partners participated in their contributions towards the interim project report. This required the collection and documentation of important project documentation to date, such as outcomes completed to deadlines and dissemination activities carried out to date within the project funding period. All partners provided their relevant documents in a timely manner to the project contractor, who was able to submit the interim project report on time. During April, partners were busily engaged in the preparation of materials to be submitted for the interim project report. All papers submitted and presented at conferences, articles published by national and international magazines and journals, and dissemination materials such as leaflets and posters were compiled for inclusion in the report. A Skype meeting took place amongst project partners in order to discuss project progress and development. Preparatory discussions took place for the upcoming partner meeting in Turkey, which was then attended by all partners. Meeting minutes were drafted following the partner meeting and used to highlight what areas of the project needed attention, and what work needed to be reviewed. 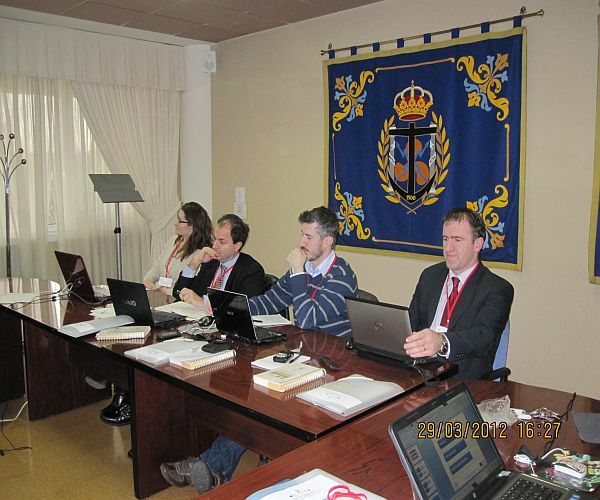 CAPTAINS 3rd Partner Meeting, 29-30 March 2012 in Cadiz, Spain. 10 project members have participated, representing 6 partner organisations (Aegean, C4FF, TUDEV, AIT, UCA and OPR), including Skype connections with partner from EPAL. The design of Unit 1 was completed by project course designers and AIT presented the first draft of the standalone version of this Unit. AIT, WP5 leader, has released the new release of KWEBO at the end of March 2012. KWEBO is the e-learning 2.0 open source platform which will host the CAPTAINS e-courses and partner learning communities during the envisioned pilots. The new platform features Web 2.0 tools and services for collaborative content authoring (Wikis, blogs, podcasts, etc.) as well as tools for synchronous collaboration and communication (video conference, virtual class environments) as embedded to e-course and easily initiated services to allow for single sign on access to registered users. The design of Captains Unit 1 was finalised and completed by the project course designers in this month, with the final draft being presented by one of the partner organisations at a range of events and conferences. The content was also trial uploaded to the Captains website to test stability, accessibility and functionality, where it will eventually reside on the KWEBO platform, at the end of the project. All partners were involved in reviewing the Unit 1 content and course structure, and feedback was provided to the course designers with the intention of improving the design where necessary. 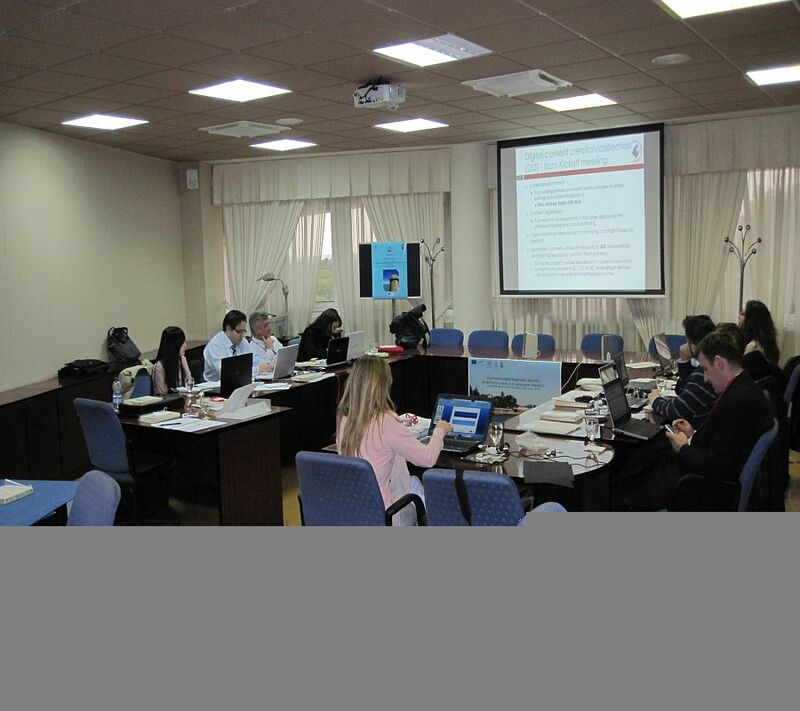 Preparations were made by all partners for the 3rd project partner meeting, which was held by the partner UCA in Cadiz, Spain at the end of March 2012. Partners went through the recently completed first unit of the course and held discussions on the successes of this deliverable, and how to proceed next with the project work. -Sihmantepe, A., Sernikli, S., Ziarati, R. “Building Maritime English by Event Simulation"
Great progress was made in Modular courses and learning content (WP4). Unit 3 is now almost completed. The course content will consist of rich media interactive presentations and simulations (either 2D or 3D) of e.g. everyday dialogues among the crew onboard ships or virtual collaboration spaces, that will include stimulating content such as videos, sounds, graphics, text in various formats, group activity assignments, rich media quizzes, etc. A second teleconference was held between C4FF, AEGEAN, TUDEV, AIT, and EPAL to discuss course design in more detail, building on the decisions made in the previous teleconference. A number of key decisions were made regarding the design of the courses. C4FF presented CAPTAINS paper ‘CAPTAINS - Communication and Practical Training Applied in Nautical Studies’ at BRIDGE 2011. Aegean presented CAPTAINS paper titled ‘Building the intercultural dimension in new learning tools for seafarers: The captain’s platform for maritime English’ at ECONSHIP 2011. ECONSHIP provides a global forum for maritime industry actors, researchers and other parties interested in Maritime topics, including Maritime English learning/ teaching. EPAL designed the specifications for the first scenario, which is to be based upon the Lykes Voyager / Washington Senator collision. This will be reviewed by partners, and the first CAPTAINS course will begin to take shape. A teleconference was held between C4FF, AEGEAN, TUDEV, AIT, and EPAL to discuss course design in more detail, building on the decisions made in the 2nd partner meeting. A number of key decisions were made regarding the design of the courses. The Scenario Based Learning Approaches Report was produced by AEGEAN. This detailed report covers the theoretical basis of the course design, reviews the outcome of the needs analysis, and provides novel pedagogical approaches for supporting the CAPTAINS learning tool. The second partner meeting was held at TUDEV Institute, Istanbul on the 16th and 17th May. Representatives from all partners attended, and the project progress to date and plans for the next 6 months of project were discussed. The aims, expected results, content and technical specifications of CAPTAINS project were disseminated during the 130th Anniversary Conference for the Nicola Vapstarov Naval Academy to an audience of Maritime education specialists and senior policy makers from across Bulgaria. Several real life accident scenarios (caused by failures in communication) were selected to be developed into exercises. These accident scenarios were selected from the knowledge base supplied by C4FF (as part of the WP2 needs analysis) These were discussed in detail at the partner meeting. A discussion session for maritime English teachers and specialists in applied linguistics was held online via Skype on 2nd April. The meeting was led by the University of the Aegean and included participants from Bulgaria, Belgium, Greece, Turkey, and the UK. In this session, matters relating to the design of the course (WP3) in terms of the content language level and approaches to IT were discussed. TUDEV and EPAL made their contributions to WP3 (novel learning approaches) by proposing the framework for the contents of the course, including level, suggested topics, skills, vocabulary, and aspects of cross cultural communication. AEGEAN set out the theoretical framework for WP3, which concerned the novel learning approaches to be developed as part of the project in relation to the results of the survey. AEGEAN will guide EPAL in the creation of the first course, to ensure that it follows the results of the needs analysis. The questionnaire results were extracted from the online survey, and an analysis of the questionnaire results was made and circulated to partners. It was decided that the questionnaire would remain open for the duration of the project in order to collect additional data. AEGEAN, TUDEV, and EPAL began working on novel learning methods for CAPTAINS. AEGEAN had been working on the existing literature review and analysis of state of the art regarding methodologies and course design since the project began. The result of this work - a review of state of the art literature in ESP and in competence-based and vocational learning has been completed, and a ‘protosyllabus’ was designed and was circulated within the partnership. The document clarified certain points concerning WP3 (novel learning approaches) and determined the input expected from each partner. Consultation with stakeholders and field specialists such as foreign instructors in maritime academies, professors in technical and vocational institutions, active seafarers, ship owners, crew managers, and professionals involved in the field (coast guards, shore-based personnel, etc) took place. Moreover, workshops were organized to that effect in which, in addition to the stakeholders initially involved, outside experts conferred their know-how regarding the smooth integration of the various learning components detailed in the protosyllabus. The reports giving details of the consultations with stakeholders from EPAL, TUDEV, UCA, and C4FF were compiled into a ‘user workshops results report’ (deliverable 12) by C4FF. Deficiencies and shortcomings in existing learning methods were pointed out by learners in the questionnaire phase. At present, an effort is being made to triangulate these findings with qualitative and quantitative data from other sources, and discover whether these deficiencies (otherwise known as learners’ perceived needs) correspond to real needs, as well as finding the best way to address them. The articulation of a method dealing with said deficiencies, and destined to cover the special needs of the target group of the end users, is under way. 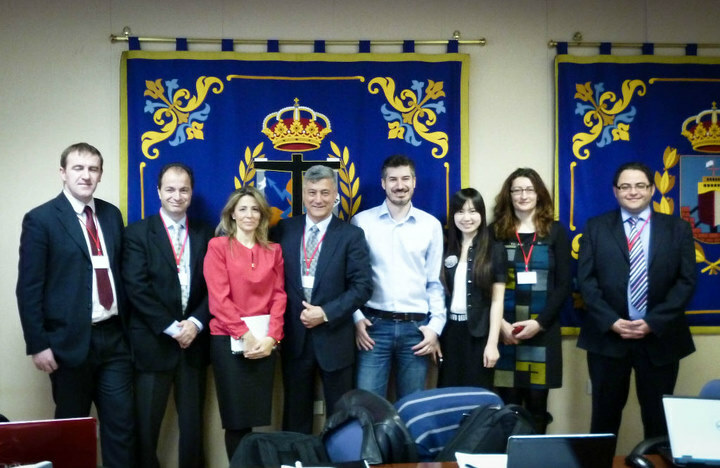 Of special interest are the synergies expected from the collaboration of such a rich range of partners (AIT, TUDEV, FCC, EPAL, the Polish Centre of Development Works, University of Cádiz - Faculty of Nautical Sciences), which are expected to enhance the Intercultural Dimension with their suggestions. A ‘knowledge base’ of maritime accidents due to inefficient English communication was researched and produced by C4FF with support from AEGEAN. This deliverable is based on the input from the target groups and stakeholders. It associates communication problems in English with critical situations at sea. It will assist in the definition of the novel learning and technological approaches to be followed in subsequent WPs. In particular, it will assist the definition of real-life scenarios and the respective learning goals and associated learning methodology and tools, as well as providing the basis to understand how inter-cultural competence can be achieved. The two questionnaires which had been produced, forming the first part of the needs analysis, were distributed widely by all partners to target groups. On collection of the results, a full analysis will be made, and workshops will be orchestrated to validate the questionnaire results. The questionnaires (one for seafarers and one for Maritime English teachers) are available in the ‘survey’ section of this website. The KWEBO project webspace was created by AIT, which will allow partners to share documents related to the project. Partner contracts were distributed by AEGEAN. The CAPTAINS project website was unveiled by C4FF. 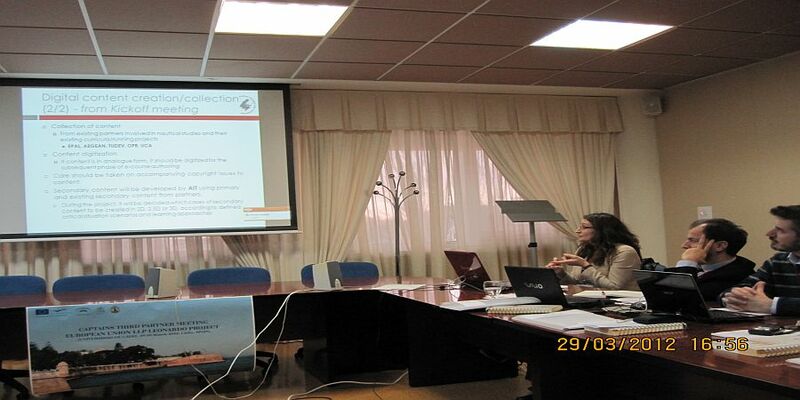 AEGEAN produced a quality assurance plan, which was shared with the project partners for their comments. The ‘pilot’ needs analysis questionnaires were completed by around 100 cadets at TUDEV, and a full analysis of the results was performed. This initial pilot questionnaire (which was formed by TUDEV based on a 'pre questionnaire' - the results of extensive research carried out by Lina Iakovaki of AEGEAN) were the key sources and basis for C4FF to produce the two questionnaires: one for Maritime English teachers, and one for experienced seafarers, which includes a section on accidents relating to communication failure. These questionnaires were augmented with extra questions by AEGEAN and C4FF, and circulated throughout the partnership for additional comments and improvements. These came from EPAL and UCA. TUDEV and C4FF reviewed the changes together, and edited the questionnaires. These will be uploaded to the project website in digital format. Three potential project logos were produced by C4FF and were circulated amongst the project partners. The partners voted for their favourite of the three, which was incorporated into the project website and other project documentation. The CAPTAINS kick-off meeting was held in Athens on the 18th and 19th of November, and was hosted by the 1st Evening Vocational High School of Egaleo. Here the partners met and discussed the project in depth. The user needs analysis began with the production of an initial pilot questionnaire for cadets by TUDEV, based on a ‘pre-questionnaire’ – the results of extensive research carried out by Lina Iakovaki of AEGEAN. The questionnaire will be given to cadets at TUDEV. C4FF have produced a specification for the project website. Preliminary meetings were held between the project managers (AEGEAN) and the project co-ordinators (C4FF) in preparation for the first partner meeting. The CAPTAINS project was awarded funding by the EU.